Wicks | White Mist Co.
Japanese cotton pads make the perfect wicks, and have no taste at all. You are in fact buying 100% real deal, Japanese organic cotton, and not just some store bought cotton pads claiming to be Japanese cotton. These cotton pads are coming fresh from the Japanese cotton fields where they use no pesticides, and no bleach; just good old fashioned clean dirt to grow all their organic cotton. 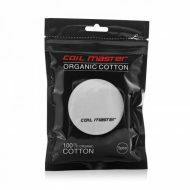 Coil Master Organic Cotton is organic Japanese cotton for wicking. No chemical treatment, no bleaching, no colorant: just pure cotton! 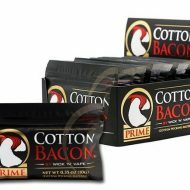 Each resealable pack contains 5 extra-large sheets of cotton. Each sheet comes in its own plastic sleeve to prevent the sheets sticking together and to help the cotton keep its shape. 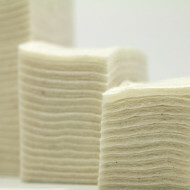 Each sheet is approximately 9cm x 7cm; about twice as large as standard cotton pads by area. This cotton wick absorbs a large amount of liquid and allows the flavor of your juice to come through in the purest form. Brown specks in the cotton pad are normal for organic cotton. 100% natural material, possesses a fine texture of absorbent cotton, no bleaching, no colorant, and no chemical treatment. Suitable for RTA. RDA, and RDTA. The Wick N Vape Cotton Bacon V2 Organic cotton has been specifically manufactured for vaping. We selected the US. grown cotton fiber. The cotton is taken with proprietary purification process to remove impurities, natural oil and pesticides. The medical level facilities make sure all processings are carefully treated and 100 percent tasteless cotton for wicking. 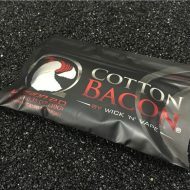 Cotton Bacon is created in a state of the art facility to provide vapers with an easy-to-use 100 percent tasteless cotton wick, which is easy to pinch and tear. 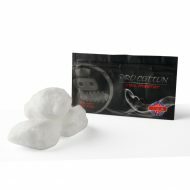 The Cotton Bacon Prime is an ameliorated fiber, which is more absorbent and totally adapted for the reconstructable atomisers. The Cotton Bacon is undoubtedly efficient with Bottom-Feeder.